Note: SynDaver Canine currently ships with skin only on the abdomen and forelimbs. However, we are developing fur and skin for all other areas and will provide this upgrade to all of our customers free of charge. We expect availability by end of year. She is a life saver, but she is not alive. She breathes and bleeds just like a real dog. She has individual muscles, bones, and organs – and can be operated on repeatedly without risking a live animal. Click here SynDaver Surgical Canine Info Sheet for more info. 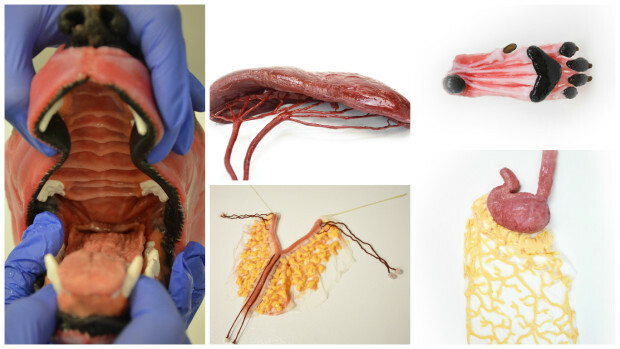 SynDaver Canine is superior to animal cadavers because it is designed to mimic live tissue. And since SynDaver Canine can be repeatedly serviced for continued use, it will last essentially forever – unlike cadavers – which must be continually acquired and disposed of. And finally, students and faculty will not be exposed to the carcinogenic formaldehyde used to preserve dead animals. How many surgical procedures will this model support? Do you throw this model away after use? No! SynDaver Canine may be repaired indefinitely so surgical procedures may be repeated over and over again essentially forever. We still have parts on hand that were made 25 years ago! What risks or challenges do you foresee with this initiative? A small group of people will be actively working against us because they do not want the practice of live animal use in education to be discussed. Others feel that cats and dogs sourced from shelters are fair targets of exploitation for terminal labs because they are ‘unwanted’ animals. What is a terminal surgery lab? Terminal surgery labs involve teaching students surgical procedures on live animals under anesthesia. After the surgery is performed by students the animal is not allowed to wake. It is euthanized. How many veterinary colleges use terminal labs? Our survey of domestic veterinary colleges currently shows that 26.7 percent of them DO NOT engage in any sort of terminal surgeries. However, 16.6 percent responded that they DO engage in terminal labs while the remainder (53.3 percent) declined to answer the question. We are assuming that those declining to answer are still engaging in terminal labs. We have not surveyed schools outside of the USA, but we expect terminal labs are more prevalent in the rest of the world.